Mazda Certified. FUEL EFFICIENT 37 MPG Hwy/28 MPG City! Mazda3 4-Door Sport trim. Onboard Communications System, Keyless Start, Smart Device Integration, PREFERRED EQUIPMENT PACKAGE, Back-Up Camera, iPod/MP3 Input. CLICK NOW! PREFERRED EQUIPMENT PACKAGE bright beltline trim, satin silver steering wheel spoke and HVAC control dial trim ring, Automatic On/Off Headlights, Wheels: 16" x 6.5J Alloy, Advanced Blind Spot Monitoring, rear cross traffic alert, Body-Color Power Folding Heated Exterior Mirrors, turn signals, Rear Seat Armrest w/Cupholders, Rain-Sensing Windshield Wipers, 2-speed and variable-intermittent. 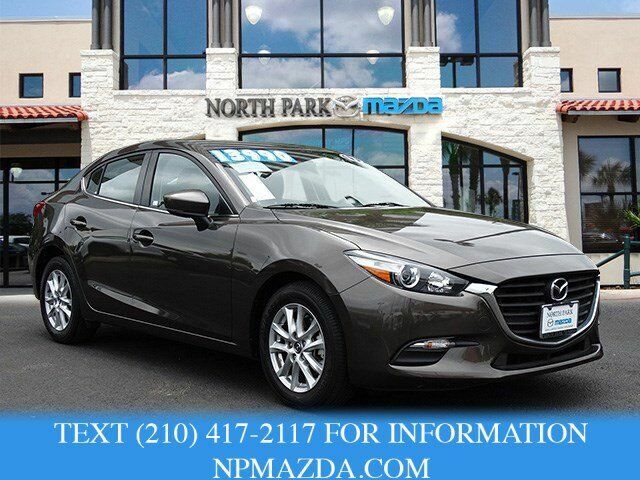 Mazda Mazda3 4-Door Sport with TITANIUM FLASH MICA exterior and BLACK interior features a 4 Cylinder Engine with 155 HP at 6000 RPM*. "Fuel-efficient and a blast to drive, the Mazda3 is a reasonably priced small car filled with high-end features. With better handling than a Toyota Corolla and sleeker styling than a VW Golf, the 2017 Mazda3 covers a lot of different bases." -KBB.com. Great Gas Mileage: 37 MPG Hwy.